Howard Burlington Grubb was born in York, England, in 1881. He obtained his B.S.A. from the Cornell School of Landscape Architecture before returning to England in 1908 to work for T. H. Mawson as an apprentice. He married another successful young landscape architect, Lorrie Alfreda Dunington, whose name he adopted. They emigrated to Canada in 1911. The Dunington-Grubbs established a practice that soon became highly successful, especially after founding a much-needed nursery to provide ornamental plant material at Sheridan, Ontario. The hiring of Sven Herman Stensson from England to operate Sheridan Nurseries resulted in a profitable relationship between the two families. The Dunington-Grubbs and, later, the firm of Dunington-Grubb and Stensson, were responsible for designing both private and public gardens. These included municipal contracts, such as the 1914 plans for the City of Brantford and other urban projects for churches, educational institutions, apartments, clubs, parks, factories and public buildings. Working largely in the greater Toronto area, Dunington-Grubb and Stensson was also awarded projects as far afield as the University of Calgary and the Manitoba Parliament Buildings. Chief among the urban public works represented in the Guelph holdings are the plans for the Oakes Garden Theatre and Rainbow Bridge Gardens in Niagara Falls, Gage Park and the McMaster University Entrance Park in Hamilton, the Workman's Compensation Board grounds and the central boulevard of University Avenue in Toronto. During the 1950's commercial firms such as the Ford Assembly Plant at Trafalgar, and the Imperial Oil Company in Toronto, engaged the services of Dunington-Grubb and are also represented by planting plans. Active until shortly before his death in 1965, H.B. Dunington-Grubb was a founding member of the CSLA, its president in 1934/35 and 1945 (carrying on his late wife's term of office), and its secretary in 1953. He lectured for over 25 years at the University of Toronto, contributed many articles to scholarly journals, and was active in several professional organizations, including the Arts and Letters Club of Toronto. He was the recipient of numerous awards and honourary positions, including the first Allied Arts Medal from the Royal Canadian Architectural Institute ever awarded to a landscape architect. While his imaginative and original garden designs of inner city and suburban estates remain a monument to his artistry, his innovations in the field of urban improvement and environmental design are his most significant contribution to the profession. He became a fellow of the CLSA in 1964. He died on 26 February 1965, aged 84. An associate in most of her husband's work, Lorrie Alfreda Dunington-Grubb was an active partner in their firm. Born in 1877 in England, she attended Swanley College of Horticulture in Surrey and had founded her own private practice before her marriage in 1911. Drawn to landscape architecture by her love of floral design, she published in both English and Canadian journals and was a founding member of the Canadian Society for Landscape Architects (CSLA) in 1934 and its president in 1944. She died shortly afterwards in January 1945. Sven Herman Stensson came to Canada in March 1913 in response to an advertisement placed in a newspaper by H.B. Dunington-Grubb. Previous to his move to Canada, he was chief gardener for the Crown Prince of Denmark at Knuteburg Castle, and gardener at the Kew Gardens in England. Once in Canada, he began to manage Dunington-Grubb's new Sheridan Nurseries, one of the first nurseries in Canada to embark on the "risky" practice of investing in purely ornamental stock. Accompanying Herman were his wife, Annie, and their sons, Jesse Vilhelm, Fred, Chris, and Howard. Jesse Vilhelm Stensson was born on 23 July 1907 in Hitchen, England. He studied architecture at the University of Toronto in the late 1920's and continued with the Harvard University School of Design. After his formal education, Stensson became a key figure in the development of landscape architecture in Canada. Stensson became one of the founding members of the Canadian Society of Landscape Architects in 1934, and its secretary in 1935, when he helped to draft the Society's original by-laws. He went on to become the president in 1937-8, and 1947-8. From 1938 to 1965, he was the general manager of Sheridan Nurseries.In 1954-55 he was the president of the Canadian Nursery Trades Association, president of the Canadian Ornamental Plant Foundation, and treasurer of the Meadowvale Botanical Gardens. J.V. Stensson was a significant contributor to the promotion of new plant materials, and acted as an important liaison between professional and nursery trades associations. His contributions to landscape architecture were significant, and included such projects as the Harry Oakes Garden Theatre in Niagara Falls; Gage Park, Hamilton; McMaster University Entrance Gardens; and University Avenue, Toronto. He has also been credited with architectural plans for the Sheridan Nurseries buildings. Stensson died on 8 March 1972, aged 65. In 1956, J.V. Stensson met and married Janina Korkuc, a professionally educated and internationally known landscape architect. The two formed a marvelous working relationship. After J.V. Stensson joined Dunington-Grubb, the focus of the firm gradually shifted from residential design to public and commercial projects. This direction continued after Janina joined the firm. In 1959, Jesse Stensson left the firm Dunington-Grubb and Stensson, remaining at Sheridan Nurseries while Janina stayed with the firm. She died in 2009. The Dunington-Grubb and Stensson fonds consists of 940 drawings grouped under 241 project titles acquired from the Stensson family in 1977 by Professor Owen Scott who deposited them in the Library in 1981. Additional materials were donated by Janina Stensson in 1989 and in 1990. 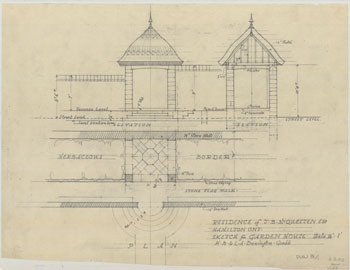 Chiefly pencil drawings, including preliminary sketches of planting plans, surveys and details, there are also several drawings renderred in pencil crayon, ink, and watercolour. Photographs or slides exist for some projects. Approximately two-thirds of the fonds represent private assignments, but business and government contracts include parks, churches, schools, hospitals, apartments, clubs, factories, and offices. The entire Dunington-Grubb and Stensson collection can be viewed via the library's catalogue, PRIMO. This collection is a physical collection which is available for viewing in Archival & Special Collections during our regular business hours.